Use Sibelius 7 Sounds and Sibelius 6 Essentials at the same time! Sibelius 7+ only allows for there to be one instance of Sibelius Player active in a given Playback Configuration. And since you can only assign one sound set per device instance, this leaves users without the option to use Sibelius 7 Sounds and Sibelius 6 Essentials at the same time. But don’t fret, the S7S-SE6 SoundSet handles this by having both the S7S and SE6 sound sets combined into one file. And if you don’t care to have all the instruments already predefined for you, then this sound-set-only package is for you. NOTE: This item is included for FREE when you purchase S7S Template and SE6 Template together. See our Sibelius Bundle Builder for more. 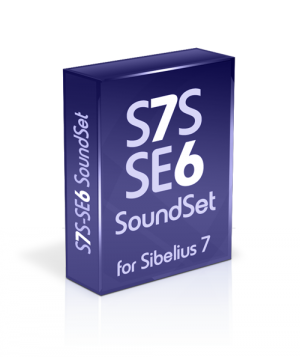 S7S-SE6_SoundSet_7.1a.xml – S7S and SE6 combined sound set file that allows access to both libraries in your one instance of Sibelius Player. S7S-SE6_SoundSet_7.1a_Lite.xml – The Lite version of the combined sound set, applicable to S7S patches only. S7S-SE6_SoundSet_Readme_7.1a.pdf – Installation and setup instructions. SINGLE-USER_License.txt – A copy of the license agreement. Sibelius is now on version 8. Get Sibelius 8 now! Your computer system spec requirements are dependent on what is needed by the software items above. Consult the documentation that is provided with them for details. This template falls under our SINGLE-USER License. We also have Multi-User Licenses available. Please use our Contact page to request a quote.